Dr. Cohen is a dentist for children as well as the whole family and has been treating pediatric dental patients in Mission Viejo for 30 years. Dr. Cohen along with his wife Judy (who also works in the office) have raised three kids of their own and they understand the importance of taking care of your children’s teeth as a part of their overall health. Baby teeth, also called primary teeth, are important for the correct oral facial development of the upper and lower jaws and the proper positioning of the permanent teeth. Prevention is the best medicine and for dentistry, prevention comes in many forms. Sealants: Sealants aid in preventing decay by filling in the deep grooves of the back teeth. They may be applied to permanent and primary teeth. Fluoride: Fluoride systemically (in the form of a supplement or in the water supply) and topically (professionally applied by pediatric dentists and in toothpaste and/or fluoride rinses) is one of the best aids for preventing tooth decay. Professional visits: Every child should see a kids dentist at least by the age of 2 (sooner if there is a problem) and they should continue to see a children’s dentist at least every 6 months. Injuries: Avoiding injuries with the use of mouthguards and parental supervision is the best solution, however once an injury occurs fast action is usually necessary. Teeth that are knocked out or loosened (especially permanent teeth) need to be attended to immediately. (Knocked out teeth can be preserved longer in cold milk or human saliva). Role model: By taking good care of your own teeth, you serve as a role model for your child. It’s not difficult to help children establish a good oral health routine at an early age. In fact, this will provide your child with some measure of “smile insurance” for years to come. When you book your child’s appointment with Dr. Cohen in Mission Viejo, make sure you book appointments for the whole family. 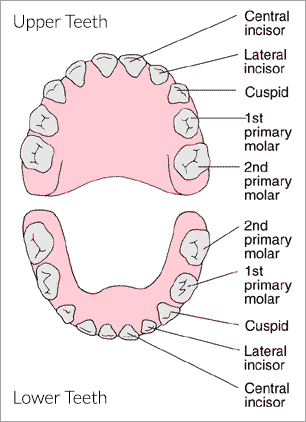 The following chart provides a guideline to when you can expect your child to get their primary teeth and also when they will lose these teeth to make room for their permanent teeth.